A crazy (by NFL’s standards) trade deadline saw some big names change teams. Here is the fantasy football impact of the trades around the league. 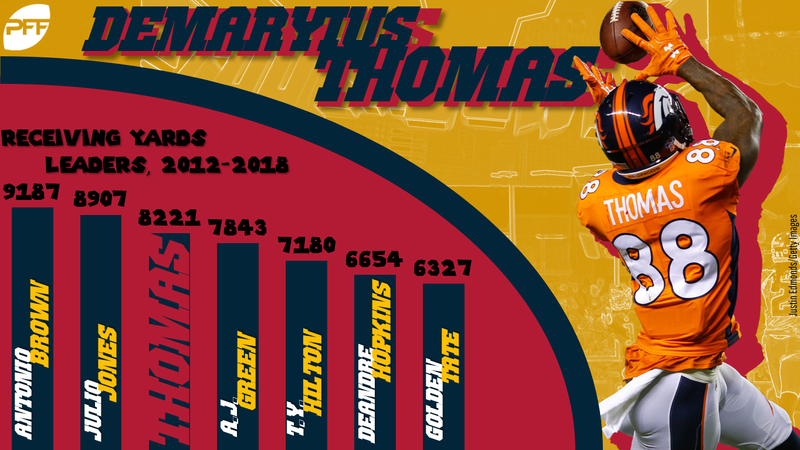 Thomas currently ranks 42nd among wide receivers in fantasy points per game (11.8) and 31st in targets per game (7.0). Will Fuller, out for the remainder of the season with a torn ACL, ranked 22nd in fantasy points per game (15.2) but 42nd in targets per game (6.0). This is probably somewhere between a lateral move and a slight upgrade for Thomas. Target volume should be about the same, but his cornerback schedule should soften up and efficiency should also be improving based on the upgrade Deshaun Watson (12th in passer rating) presents over Case Keenum (27th in passer rating). That said, he’s still just a high-end WR4 moving forward. I’m not adjusting my pre-Fuller-injury expectations for anyone on the Texans, but this trade is significant for Emmanuel Sanders and, especially, Courtland Sutton. Per Ian Rapaport, “It’s Sutton’s time.” Per Jeff Darlington, “Denver believes Sutton is ready to be a star.” Sutton hasn’t done much for fantasy this season, ranking outside of the top-70 wide receivers in fantasy points per game and targets per game. Though target volume has been low, target quality has been good, ranking ninth in end-zone targets per game (1.1) and 24th in deep targets per game (1.6). In any case, target volume should be much better now with Thomas out of the picture. I’m bumping Sutton up to the mid-WR4-range with room for upside. Sanders ranks 10th in fantasy points per game and should get a boost with Thomas out of the picture. He’ll see better volume now (currently 18th in targets per game) and will continue to avoid CB1s from the slot. WR DaeSean Hamilton is a name to watch but not necessarily a player to add. With this trade, Tate falls from a high-end WR2 for fantasy to a low-end WR2. In Detroit, he held a team-high 25.5% target market share, averaging 2.5 targets per game more than the next-closest receiver. In Philadelphia, there’s far less of a guarantee he’ll be Carson Wentz’s top option. Since Jeffery has returned to the lineup, he’s seen a 24.7% target market share, just behind Zach Ertz’s 28.2% and ahead of Nelson Agholor’s 17.2%. Both Agholor and Tate have run over 60% of their routes from the slot this season, so it will be interesting to see who will be forced to play more outside. Agholor has only ever been effective in the slot, while Tate is arguably one of the league’s best slot wide receivers. If Tate is forced to play more outside, rather than in the slot, that’s another reason for the downgrade, as is the fact that he’s starting over in an unfamiliar offense with a new quarterback. 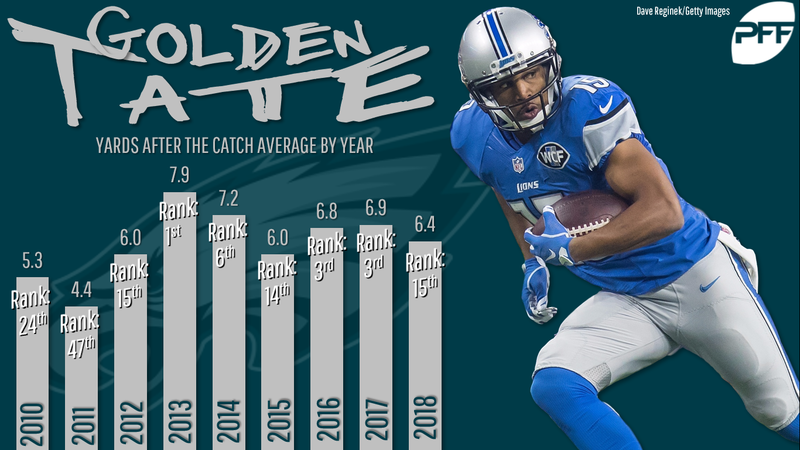 Agholor’s stock takes the biggest dent upon Tate’s arrival. Even if Agholor gets to remain in the slot, I’m not sure he will again be startable at any point this season. Ertz and Jeffery only get slight downgrades due to fewer available targets now that the receiver room got a little more crowded. Carson Wentz, meanwhile, gets an upgrade due to the luxury of being able to throw passes to one of the league’s best receivers. This is a huge boost to the fantasy stock of both Marvin Jones and Kenny Golladay. Jones and Golladay both rank top-30 at the position fantasy points per game, despite ranking behind Tate in targets. His vacated 25.5% target market share, or 8.9 targets per game, could thrust both receivers into the WR2-range. Losing Tate also obviously hurts Matthew Stafford’s value. It’s hard to say what exactly this means for the Ravens. They, obviously, didn’t give up much to acquire Montgomery, so it is possible this is just an acquisition for better depth at the position. However, I suspect he’s legitimate competition for Javorius Allen, the team’s primary running back on passing downs. 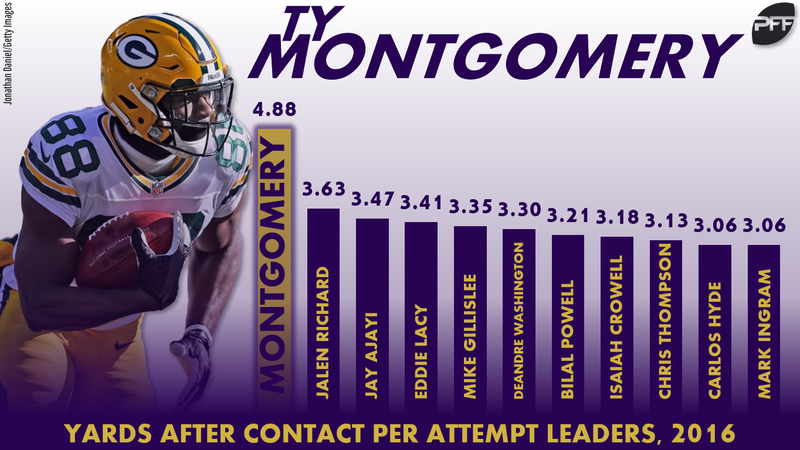 This was Montgomery’s role in Green Bay, and Baltimore ranks second in running back targets since 2015. This also opens up opportunities for Aaron Jones and Jamaal Williams. Montgomery leaves behind a 31% snap share as well as 26 carries and a team-high 20 targets. However, it seemed Montgomery was already on his way out. In Week 8, Montgomery played on only six snaps to Jones’ 32 and Williams’ 13. Jones saw 12 carries and two targets, Williams saw four carries and zero targets, and Montgomery saw two carries and two targets. Jones is the running back to own moving forward.